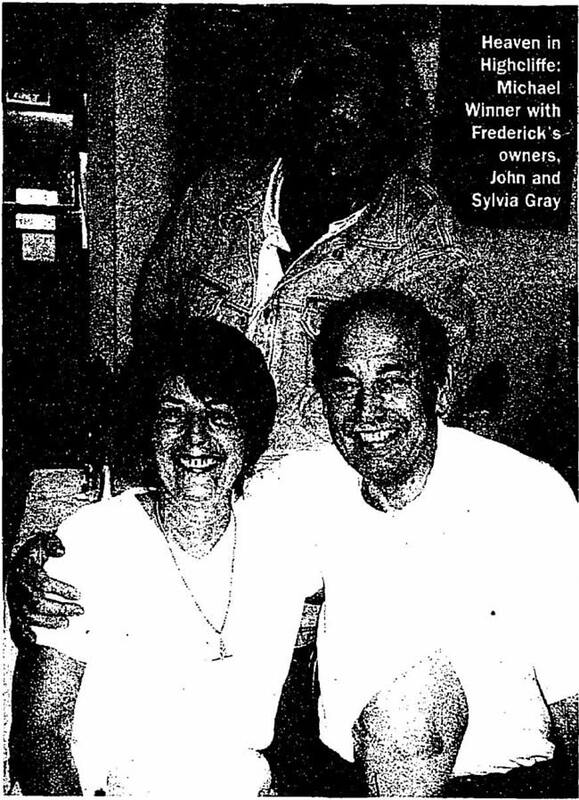 I can think of no restaurant in the history of my life that I less wanted to go to than Frederick's. It's situated in Highcliffe, Dorset, home of Sainsbury's Youth Choir of the year. When staying at the nearby and excellent Chewton Glen, I'd often driven past in my search for an evening meal and always thought that Frederick's looked gloomy and uninviting. It is next to the Craft Wool Shop and Tapper Funeral Services, fronted by a board announcing the Ken Dodd Happiness Show. I passed it by yet again on a recent visit as we looked tor somewhere else. After wandering here and there and finding nothing remotely interesting, we sadly agreed that, this time, Frederick's it would have to be. It was Saturday night and there were only two other couples in the place. It had a desolate air, not saved by the sound of Frank Sinatra singing Chicago. "We're a bit quiet tonight," said a tall, gangly man in dark trousers and a white, short-sleeved shirt, who turned out to be called John. "Not any more you're not," I said, sitting down at a table with a blue tablecloth and matching blue candle. The chintz lamp shades matched the curtains. John produced a small selection menu - quite clever, better than trying to do too much - and informed us this was his ﬁrst restaurant venture. "I used to work for the Home Office. I came under the Official Secrets Act," he told me subversively. It turned out he used to be a TV licence inspector. I didn't like to go into it too deeply. Maybe he was looking for Chinese spies at the same time. John assured me that the lemon sole was fresh and the only one left. I started with roes on toast. "You won't get those anywhere else," said John. "You will at Sheekey's," I said boastfully. I studied the other two couples. They were rather nice. Elderly, quietly dressed, but they'd taken some trouble. Quietly spoken, too. I pointed out my candle wasn't lit. "That's nerves, that is," said John. The roes on toast were excellent. Vanessa's melon and grape cocktail was good. My sole with duchess potatoes, sautee potatoes, red cabbage and string beans was memorable. The veg were cooked perfectly. Vanessa had a vegetarian peanut and lentil layer with veg. That was superb. This was really all rather excellent. The service was a bit slow, but the menu warned us that Sylvia was cooking in the kitchen, adding: "You may have to wait 20 to 30 minutes for your meal." I'd hate to be there when it's full, I thought. It was also quite fun calling "John!" from time to time. He was definitely a bit deaf, bless him. "Were you calling me?" he'd ask. I don't know who else he thinks I was calling. "What about the desserts? Are they bought in, John, or made on the premises?" I asked. "We only buy in the 'eye of the storm'," explained John. "Sylvia makes an excellent bakewell tart and mince pies." "I'll have 'em both," I said expansively. They were not excellent - they were totally historic. Very fresh, good home baking. I was only sorry I'd missed the apricot and pear crumble. They'd run out of that. Sadly, I was too full to try the toffee pudding made with pecan nuts. The whole meal was real, old-fashioned, personal cooking. Overpresented it wasn't; very tasty it was. Sylvia came out of hiding to take the applause. She and John used to live in Chingford, Essex. Sylvia made the desserts in Chasney's, a local place there. They'd been in Highcliffe for four years. "Done well?" I asked. "Not too bad. It's a quiet area here, but gradually people are getting to know us." "Four years, that's gradual," I agreed. I thought it was all terrific. "That was a find," said Vanessa as we walked into the street and past a notice board saying "Get your dog wormed", with a picture of dogs waiting in the surgery. "You just don't get that sort of thing in London," she added. She was right. I sent my highly sophisticated neighbour, the lyricist and recently OBE'd Don Black and his wife there. They loved it too. I can't resist giving you a quote from John Thain, managing director of the dreaded Cliveden. It's so unbelievable. It came in one of the sarcastic, silly letters he sent me. In it he sums up his view of the excellence (that's a laugh) and the ethos of Cliveden. He writes: "We are ladies and gentlemen serving ladies and gentlemen." Can you believe it? How naff can you get? Per-lease, pass the sick bag. Entering a virtually empty Casale Franco restaurant in Islington with my son, I asked for a table for three, as it was possible that my daughter-in-law would join us for coffee at the end of the meal. The restaurant was still nearly deserted when she arrived for the last 10 minutes. Yet the bill still included three cover charges. When we protested, we were told by the man in charge (I quote): "I'm a multimillionaire - and anyway, I couldn't care less." I wish this man luck running his empty restaurant with such a "customer-friendly" attitude, in an area that must have about 90 restaurants within a one-mile radius. Cliveden is pretentious and expensive. Winner is also pretentious, but - for the cost of The Sunday Times - much better value. My one experience of Cliveden bears out Winner's verdict. As a regular guest at the Dorchester and Sharrow Bay, Ullswater, I took some friends' advice and tried Cliveden as a country-house hotel. It had neither the style of the Dorchester, nor the country-house feel of Sharrow Bay. I have a remedy for the chronic indigestion from which I'm sure Mr Winner must suffer: eat at home. His one night at Cliveden cost as much as my housekeeping bill for a month. Four of us eat like kings, our crockery and glasses are spotless and the service is spot on. I had the good fortune, some years ago, to be banned from Cliveden. My sin? I was wearing denim - not scruffy jeans, mind you, but a designer white denim suit from Harrods that probably cost more than the sum total of all the staff's uniforms. Like Michael Winner, I will not return to Cliveden. I booked in for what I thought would be a special treat for my friend and me. Things started badly. We ordered vodka martinis, straight up with a twist, but after a long wait, two watery drinks arrived in ordinary straight glasses, with no lemon. This, they said, was how they always served cocktails. We then asked for dinner at 7.30pm. After repeated requests, we were eventually shown to our table 30 minutes later. The vegetable soup was watery, the main course arrived without vegetables. After much protest, we were told they were having problems in the kitchen. There were no problems with their billing system, however - the overnight stay came to £580.